No recipe today my friends. Please don’t panic. I have not fallen out of love with food. I’ll be sharing two new recipes with you before the week is complete. If you can’t wait that long click over to my recipe file where more than 400 recipes are just waiting to become your new best friend. 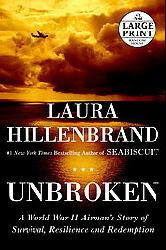 Unbroken is written by Laura Hillenbrand. It’s the biography of Louie Zampernini, Olympian Athlete and World War II survivor. It is difficult to read at times, due to the insanely harsh and unbelievable conditions Mr. Zampernini experienced during the war. However, the story is compelling, riveting and immensely moving. It’s the kind of book that makes you grateful just to lay your head down at night on a clean pillow in the safety of your own home. Page after page I found myself in complete awe of Louie Zampernini, his constant will to live, the strength of his character, and his kindness to those suffering around him. It left me wanting to be better, do better, live better. Read it, my friends. Your time will be well spent. I would love to order a copy of this book for TWO of you. To enter the giveaway, leave me a comment telling me one of your favorite books, and why you loved it. Also, please leave your email address with your comment. You can enter from now until Sunday night at midnight. The winners will be announced Monday morning bright and early with the sunshine. I just finished Escape from Rwanda. A short read, but a feel good one. I am happy that I have so far kept up with my goal this year….to read one book a month. I haven't read a book in SO long before that. This book you mention sounds like one I would REALLY like. I love to read anything Lisa Scottoline writes. This book sounds like an interesting read. I enjoyed reading The Kite Runner. As the wife of a U.S. Marine, I appreciated learning more about the culture of the Middle East. Unbroken has been on my list to read for awhile, what a treat it would be to win a copy! Thanks for the giveaway, Jamie! I jut finished reading the princess bride, I love it just as much as the movie, probably more. One of my favorite books is Evidence Not Seen: A Woman's Miraculous Faith in the Jungles of World War II by Darlene Deibler Rose. She was a missionary who ended up being placed in a Japanese POW camp during WWII—her husband was placed in a separate camp. There are lots of interesting historical/cultural details. But you also see God working very powerfully in her life. There is a heart-wrenching scene, that always brings me to tears where Darlene is imprisoned by the Japanese secret police and has prayed for something, and then retracts that prayer because she thinks it's impossible for God to answer. He amazingly demonstrates that nothing is impossible for Him and gives her exceedingly, abundantly above what she had asked for. And, she immediately feels so humbled. I am teary-eyed now just recounting it, and I am not someone that cries at the drop of a hat. It's an exceedingly well-written book, and definitely one of my favorites. I'm currently reading “Extremely Loud and Incredibly Close” – it's a hard read. Brings 9/11 back to the front of my brain (I lived up in the DC area when 9/11 happened) and because of the Aspergeriness of the boy (and his father) in teh story, brings me back to my every day life with my autistic son. I'm actually going to see the movie today with a friend of mine and I can't wait. Also really enjoyed “The Help” – but it took me a little bit to get into it. The language of the story was hard to get used to but once I did, I couldn't put it down. Was like that with The Best of Me by Nicholas Sparks too. Oh I can't pick just one – I LOVE to read! oops forgot my email! (jmm823@gmail.com) – as an aside – for those of us that have kindles, will you purchase book books or electrinoc books? Wow, you should work for a publisher – your description of this book is amazing! Thanks for the giveaway and the post. I want to go buy it now based on your synopsis, but I'll wait to see it I win 😉 I have to admit I don't read books very often and when I do they are usually non fiction books. What I'm reading now is a book I downloaded from Amazon for free(a $14.95value)for my Kindle app. It's titled Instant Self Hypnosis-How to Hypnotize Yourself with Your Eyes Open. So far I'm skeptical but intrigued. I read a book called the Breaking Night about a girl who overcomes the worst of circumstances to make something of herself. It is very inspiring! I just finished the Hunger Games Trilogy. I loved it….excited to see the movie. My all time favorite book is one I read as a child, and forced my daughter to read as well! The Westing Game…………it's a puzzle mystery, and I re-read it periodically. Love it just as much now as I did then! My favorite book is probably Pride and Prejudice. The attention to detail and the descriptions are amazing. Thanks for the chance. I like your calorie free days too! Oh fun. I would love to read this book. One of my favorite books is Tess of the D'Urbervilles. It's beautiful and touching and sad and heartbreaking. I love the Harry Potter series! They are my favorite books to read. They're so well written and creative. Such a fun read! My favorite book growing up was “The BFG” and I still love it today! I also read Unbroken earlier this year and loved it! By far one of the best books ever! However, I borrowed it from the library, so I would love to have my own copy. I am always reccomending it. I adore The Book Thief. It also takes place during WWII. What I really liked about this book is that you see a different side of the war…instead of bad people doing horrible things, you see it from the side of the people who risked everything to help the Jews, even if they were not Jewish themselves. Beautiful beautiful story. My favorite book has been the same since high school, 'To Kill A Mockingbird.' I think I love this book so much because of the characters. They are so well written and easy to love. I feel like I know them! Love the movie too! Thanks! I loved The Help. It really opened my eyes to racism and really the era of that book wasn't that long ago. I know that racism still exists today, but it's nothing like it was. I would love to read this book. Sounds great! I loved the Twilight and Harry Potter books of course, but as for real books, I really enjoyed The Help as for the story of how maids were treated in the 60's really shocked me! I also loved Sarah's Key. It is heartbreaking but such a worthwhile read. Also set in WWII about a survivor or the concentration camps. Your’s is the innleligett approach to this issue. I love pride and prejudice and reread it a lot. It's just a great love story. Recently I read the help and it really got to me. Made me laugh. Made me cry, just really enjoyed it. I'll have to confess someday…one of my favorite books is called “The Junkyard Dog.” I got it in probably 5th grade at a book fair, it's a short and sweet chapter book about a girl and a dog. 😉 I usually read more advanced books now (I read ALLLL the time! ), but I still pull out that one about once a year and read it in one sitting when I just need some warmth and comfort. 🙂 I actually just added Unbroken to my book wish list, so it would be awesome to win this! My husband is also in Afghanistan (for 14 months! AGH! ), so all things military have a special place in my heart. I would be thrilled to win this give-a-way! I requested it from our local library and am far in the que. It is my next selection for my book club! I have heard this is a great book! One of my all time favorite books is Jane Eyre. And one of my most recent favorites is A thousand Splendid Suns, it was one of those life changing books that really made you look at life around you and see how blessed I am to live here in America. I love to read, and it is hard to pick a favorite. I would have to say Pride and Prejudice or Anne of Green Gables. “The Hiding Place” by Corrie Ten Boom. It was a great example to me of living unselfishly and doing the right thing during difficult circumstances, even if it meant sacrificing your own life. It's a true story about Corrie's life and her family's during World War II. For little kiddos, I love “Barnyard Dance”. For young kids, I love “Junie B. Jones loves Handsome Warren”. For myself? I love a lot of books…the one that effected me the most in the past while is “Sarah's Key”. My favorite series of books is the Harry Potter books. I love them so much because of the inevitable win of good over evil. Fascinating to read and enjoy. My favorite book is a book by Gloria Naylor (author of Women of Brewster Place) called Linden Hills. It is a tale of a broken family and property lines (sounds weird I know) IT IS A GREAT BOOK! It weaves back and forth between generations and I just love that, she is a great writer. My email address is chinya76@yahoo.com and I would love to win because I love books with historical value. My favorite book is Goodnight Mr. Tom. It is about an abused boy that is evauated from London during the war and placed in a home with a grouchy old man. I love seeing both of the characters grow and develop as their trust and dependency on each other blossoms. I'm having trouble coming up with a favorite, but I just read a good book called The Unit by Ninni Holmquist. I also really enjoy Chitra Divakaruni's books. I recently finished “The Passage” by Justin Cronin. I felt like I was watching a suspenseful, nail-biting thriller. I hope someone makes a film of it! Without giving anything away, I can say that you will not be able to put this book down. There are too many books I love to choose just one! A book I read recently that made me laugh out loud while reading is “Eat Cake” by Jeanne Ray. It is about a woman who bakes cakes to deal with stress in life, sound familiar? I have read Seabiscut so I would love to read Unbroken also, thanks! It looks like I'm not the only one who loves “Left to Tell.” I love so many books, it is hard to choose one. I would love to win this book for my friend Lisa. She is very VERY sick, bedridden, and needs something to read and inspire her. sethpeggy at gmail is my email. My favorite book of all time is Charlotte Bronte's Jane Eyre. Though an old classic, its message is quite powerful. Regardless of the trials and difficulties a person may face, there is still so much to be grateful for and be optimist about.